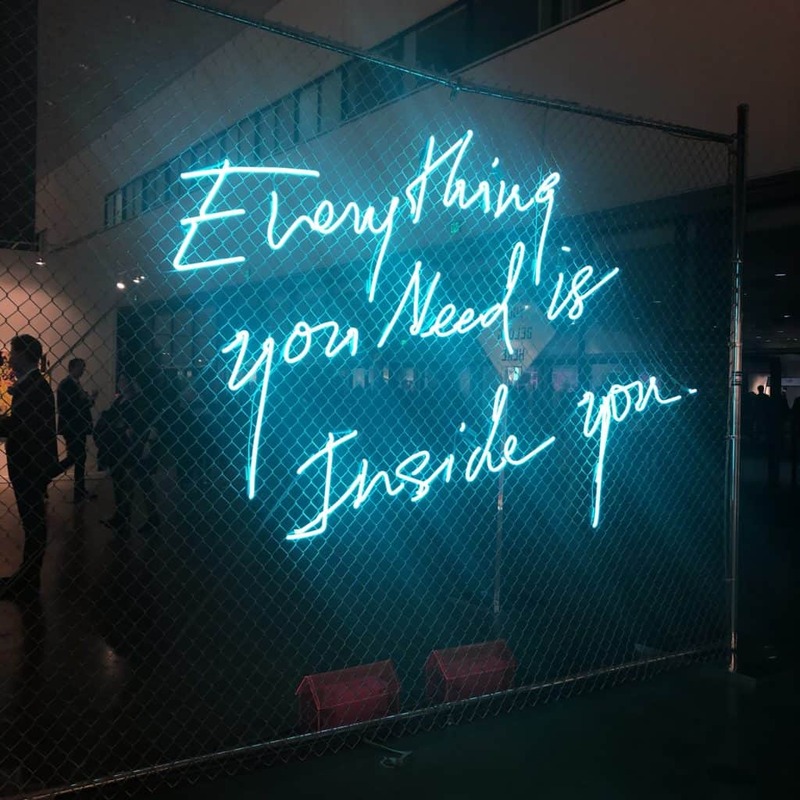 Photo Credit, Moira Cue, 2019, LA Art Show, 2019. I am one of the few people who has attended the VIP Gala of the LA Art Show every year since it was first held in the LA Convention Center in DTLA instead of the Santa Monica Barker Hangar. In one sense, it’s the most important night of the show. Celebrities are sighted, including hosts of the annual St. Jude Children’s Hospital Research Center Benefit—This year’s hosts were Gavin Rossdale and Kate Beckinsale. And, as the Bruce Lurie Gallery’s Instagram page reminds me, sales are made. I wonder every year if the Gala seems different because I am not the same person I was 365 days ago. The way I dress changes, what I eat, drink, or don’t eat and drink changes. This year, no alcohol, and no animal products. Ironically, Pink’s Hotdogs served one of the better vegan options with a full sized vegan hotdog. There was also an all-vegan bruschetta station by Vespaio, a lovely restaurant on Grand Ave, right next to The Broad. Opening night—which certain years has had all the theatricality of an Elton John concert circa 1973—felt calm, subdued even. They say when you buy a blue Volvo, suddenly the streets are full of blue Volvos. A normally functioning brain filters out so much superfluous information every day. But I only saw a handful of women draped in sequins, glamourous feathered headgear, and stilettos; and this year no one was wearing the equivalent of a human scale plushy onesie or full-body latex appendage. What stood out to me was the number of attendees, male and female, wearing the same thing that I settled on: a neutral tone business suit paired with high-end, funky lifestyle sneakers. Silver sneakers, striped sneakers, neon sneakers; even a little girl in a velvet party dress with blinking lights on her sneakers. Of course, some men just wore men’s suits with regular dress shoes. Some guys never change. There were roughly 220 galleries from 18 countries participating this year, according to the cheerful lady who introduced herself as Kim (Martindale’s) “other sister.” She lives in Alaska, and therefor rarely attends the show. Kim Martindale has been the LA Art Show owner for 23 years, and is a major figure in the exhibition of tribal art nationally. This year’s exhibit space defines galleries as members of several different sections: Core, Modern + Contemporary, DIVERSEartLA, Featured Programming, Roots, Ink Painting, Littletopia, Dialogs LA (a slate of talks and panels), Project Space, Works on Paper, Ethnographic Art, and LUXURY pbsg. Whew. Each of these sections has its own vibe and criteria and some galleries fit more than one category. To learn more about the groups, click https://www.laartshow.com/about-the-show/. For the purpose of this review, we’re going to talk about things I like. That may mean that great work in some categories isn’t covered because I just didn’t see it. Some sections are more prominent than others, and sometimes great work is missed because it’s hung in an interior corner with a lot of other work, or because of traffic patterns. To make sure you don’t miss out, you really need to go more than once, ideally at different times of day, and different days of the week. The Kamiya Art booth is the first place I was drawn to. My recent influences include calligraphic as well as black and white work, and I have always found the balance between a minimalist palette and expressionistic brushwork in more contemporary Japanese calligraphy to be very appealing. Kamiya Art; Photo Credit, ©2019, Moira Cue; LA Art Show, 2019. Kimaya Art also displayed the calligraphic art of Yu-ichi Inoue (1916-1985), who is said to be the father or liberator of modern Japanese calligraphy. For Western audiences familiar with Cy Twombly, his work would be the closest analogous example: sensitivity, great emotion, vulnerability and transcendence are concentrated into the expressive form of text. 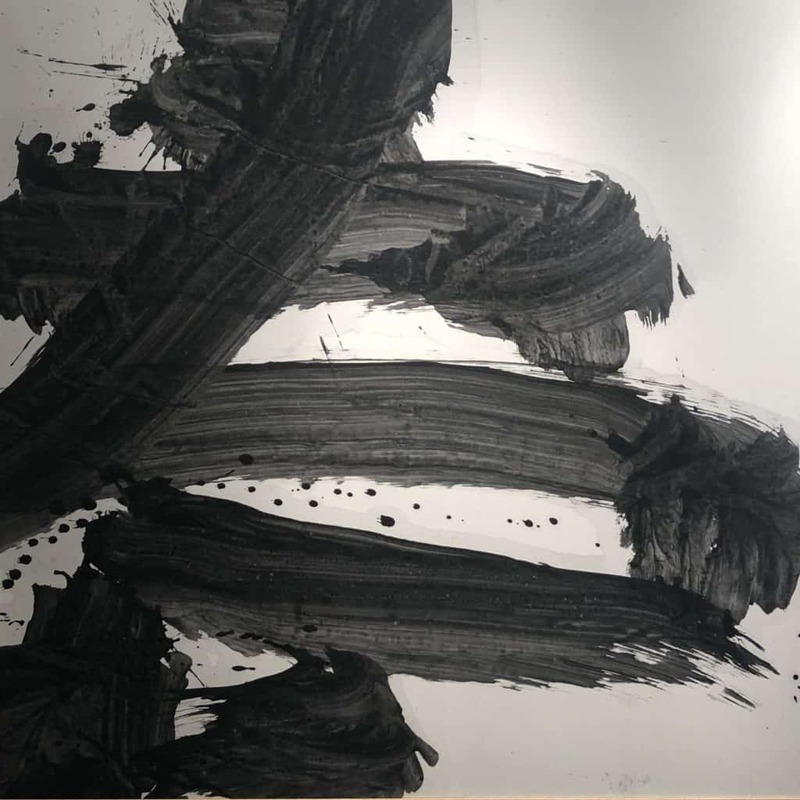 Inoue is said to have “liberated” calligraphy in the modern Japanese art world from a formal, stylized expression to a human expression of great feeling. Kamiya Art, Photo Credit ©2019, Moira Cue. While Hosokawa, born into one of Japans’ noble families, has an almost militant energy—Yu-ichi, who was without the financial means to pursue his art full time until his retirement from teaching at the age of 60—shows in his lines a poignant longing that only those who have endured deprivation and worked, patiently, diligently, quietly, toward their own liberation, can fully understand. Yu-ichi Inoue was born into an impoverished family. At 19 he became an elementary school teacher, and was eventually assigned to teach an advanced calligraphy class, which inspired him to take calligraphy seriously. When attacks on the Japanese mainland began in 1944, Yu-ichi was sent to the country with 35 6th grade boys. The children were ordered to return to Tokyo with their instructor after they graduated March 3rd, despite Yu-ichi’s pleas to keep the students out of Tokyo. When they returned, Yu-ichi found his parents’ house had been destroyed, so he volunteered to serve as a night watch at the school. On March 10, 1945, the Great Tokyo Air Raid took place, and there were around 1,000 casualties at the school, including most of his students. Yu-ichi himself fell unconscious from heat and smoke, and barely escaped death after several hours of artificial respiration. Decades later, he would create multiple-character works inspired by this memory. His single character works include, notably, letters of the name of a female teacher, 28 years his junior, with whom he developed an intense infatuation that he would later confess, with shame, to his wife. Yu-ichi Inoue is known as a founding member of the group Bokunjinkai, who published a magazine called Bokujin, with the intention of liberating calligraphy from binding tradition to embrace the naked human spirit. Calligraphy, in East Asian culture, is said to be the highest of all art forms. But it is poorly understood in the West. The life of Yu-ichi Inoue is filled with poignant anecdotes. In his thirties, he was evicted from an apartment for staining the floors and walls with paint. He spent his life’s savings to purchase a house, but after buying a lot, nothing was left for construction. In his forties, he garnered critical acclaim, for example, being selected for the Sao Paolo Biennale in 1957 and subsequently included by critic Herbert Read in his book, A Concise History of Modern Painting. But Yu-ichi was not able to concentrate fully on calligraphy until 1976, when he retired from teaching at the age of 60. I have asked myself many times if, in painting, victory deferred is sweeter. I admire artists who bend the world to their will; artists who succeed; artists who are compensated for what they do. It is not an easy task. Yet the artist who faces obstacles, who is delayed acclaim, who collects energy for his art rather than expending it on a public persona, is sometimes the one who creates work that endures, work that will nourish the viewer again and again, over a long journey. I was delighted to meet Michael Goedhuis himself and his assistant from London. They were, of course, charming people. 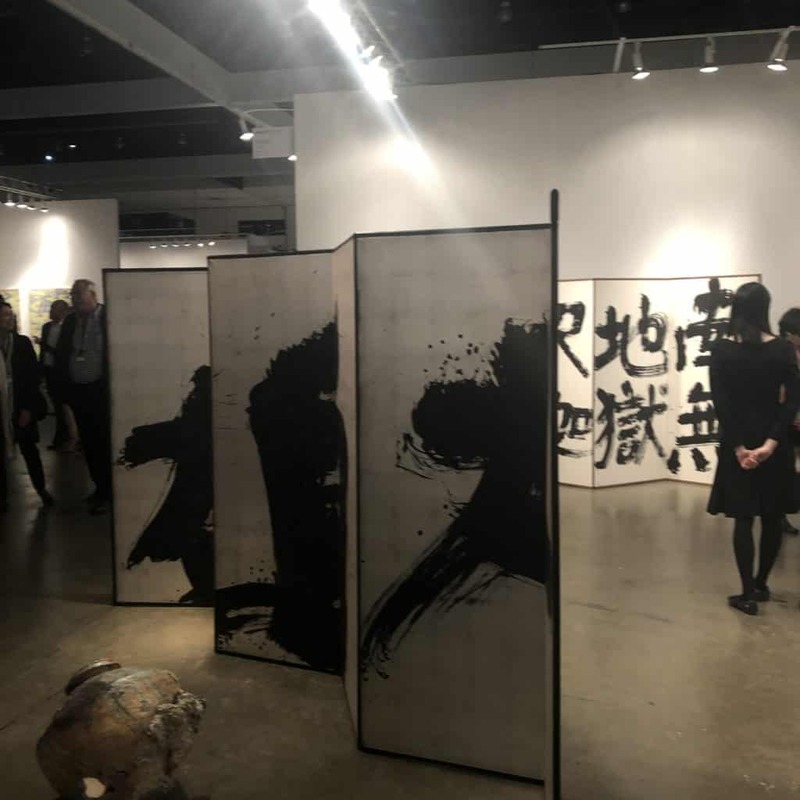 The pamphlet provided by the gallery, “Chinese Contemporary Ink Art: Why Buy Now?” is an exemplary piece of cogent marketing, and makes most of the arguments I would make in favor of purchasing calligraphic work in general and from this gallery specifically. And so, there is little left for me to say. A critic should not simply parrot the gallery; she should add something of her own, she should not pass on inferior ideas unworthy of the art they are linked to or regurgitate specious but stylized and prolix arguments that only serve to foist off an inferior product with fireworks and trendy mental gymnastics. But there is an exception to every rule, and this is it. Mr. Goedhuis a rare man who is as good at writing about art as he is at curating, displaying, and selling it. Just read this pamphlet. Goedhuis makes a clear and compelling argument in favor of buying work by a handful of contemporary Chinese calligraphic artists. These arguments include the direction of the market, the annihilation of traditional Chinese architecture, the rise of China’s investor class, and culturally-specific value that is hidden only because of the distractibility and attraction to bright shiny objects that afflicts certain minds in the West. Many people are frightened to buy art, because they don’t want to be taken advantage of or look like a fool or risk being seen as having bad taste. (Those who have truly awful taste are immune to this fear.) Art is expensive, art is personal, and there is a strange code that says we should tell inexperienced people that art is never to be purchased as an investment. But if you give no thought to the trajectory of the art’s value before you purchase it, you are failing to benefit from the mind-enhancing powers of art; just as Goedhuis asks the reader to “… understand that art for the Chinese is part and parcel of their concept of morality and how to live one’s life and how to order society” I would further add, and ask, the buyer to understand that buying art is a cognitive development tool which requires deep thinking (get your mental workouts in) about the direction of human society. It is like placing your paper boat on a current. An internationally recognized multi-media artist, Moira Cue attended the Master’s Program of the School of the Art Institute of Chicago. A prolific artist, she resides in Los Angeles, with works in collections world-wide. This content is (c). 2019, Moira Cue Multimedia, Hollywood Sentinel, all world rights reserved.